Like many other women, Lois Slemp routinely used talcum powder for feminine hygiene purposes. The Virginia resident had used Johnson & Johnson’s talc powder for four decades, and then she was diagnosed with ovarian cancer. Her cancer was initially discovered in 2012. After going into remission, she suffered a recurrence of cancer. This time, it had spread to her liver. She filed the talc powder lawsuit against co-defendants Johnson & Johnson, who is renowned for its talc powder products, Johnson’s Baby Powder and Shower to Shower Powder, and Imerys Talc—the talc supplier for J & J’s products. Slemp’s product liability lawsuit was tried in a state court in St. Louis, Missouri. Her lawsuit argued that the accumulated effects of using the defendant’s product for decades had resulted in her ovarian cancer diagnosis. Earlier in May 2017, the jury agreed with Slemp and ordered the defendants to pay a massive $110 million award. The jury determined that Johnson & Johnson was 99 percent at fault for the plaintiff’s damages, and that its co-defendant, Imerys Talc, was just one percent at fault. Imerys Talc has been ordered to pay $50,000. J & J was ordered to pay $105 million in punitive damages, and $5.4 million of the jury award was for compensatory damages. For their part, Johnson & Johnson stated that the company sympathizes with women who are diagnosed with ovarian cancer, but continues to assert that J & J products are safe for use as intended. “We are preparing for additional trials this year and we continue to defend the safety of Johnson’s Baby Powder,” said a spokesperson for the embattled company. Lois Slemp’s lawsuit is not the only one filed against J & J. The company is named as the defendant in roughly 2,400 product liability lawsuits, all of which claim that routine use of the defendant’s talc powder directly led to life-threatening ovarian cancer. A few other lawsuits have already gone to trial. 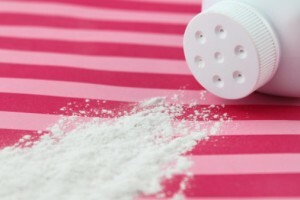 Four talc powder lawsuits were tried in the Missouri state court prior to Slemp’s case. Three of those resulted in jury verdicts that found in favor of the plaintiffs. Those cases represent another $197 million in verdicts. The first of those lawsuits was brought to trial in February 2016. In that case, the jury awarded $72 million to the plaintiffs, who were the surviving family members of a woman who had died of ovarian cancer after using talc powder. That verdict was quickly followed by another in May 2016, when a plaintiff was awarded $55 million. The third jury award was for $70 million; it was awarded in October 2016. Of the cluster of lawsuits, the only one in which the jury found in favor of Johnson & Johnson was tried earlier this year. Are you at an increased risk of kidney failure after using Nexium? Have You Been Injured by Talcum Powder? DrugReporter.com provides up to date information on lawsuits involving dangerous drugs that affect consumers throughout the country. This website is sponsored by Eisbrouch Marsh, LLC, a national law firm with principal offices located at 50 Main Street Hackensack, NJ 07601. The information found here is not legal advice. Visitors should retain legal counsel before making legal decisions. If you believe certain facts contained herein are in error, please contact the webmaster. This website contains attorney advertising.The material posted here is not intended to create nor does it constitute, a lawyer-client relationship. Visitors to the site should not act upon information here without first seeking professional counsel. Prior results do not guarantee a similar outcome in future cases.